Come home to one of Hanover Park’s finest apartment communities, full of the very best amenities, inside and out. Our renovated interiors offer you a refined living experience, for a price that is within your means. Your new studio, one bedroom, or two bedroom apartment home has everything you need for quality living in Hanover Park, including contemporary kitchen, wood-style flooring, and oversized closets. Whether you’re making a simple weekday meal or creating a holiday feast, the renovated kitchen has deluxe design upgrades you’re sure to love, such as cherry cabinets, granite-style countertops, and black appliances. Clean up is a breeze with your new dishwasher, available in every apartment. Your year-round comfort is our highest priority. We’ve included air conditioning and ceiling fans to keep you cool through the hot Chicago summers. For your convenience, we offer garage parking for all residents. The West Line Apartments community has the essential amenities you need to live life at its fullest. You don’t need a gym membership while living here. 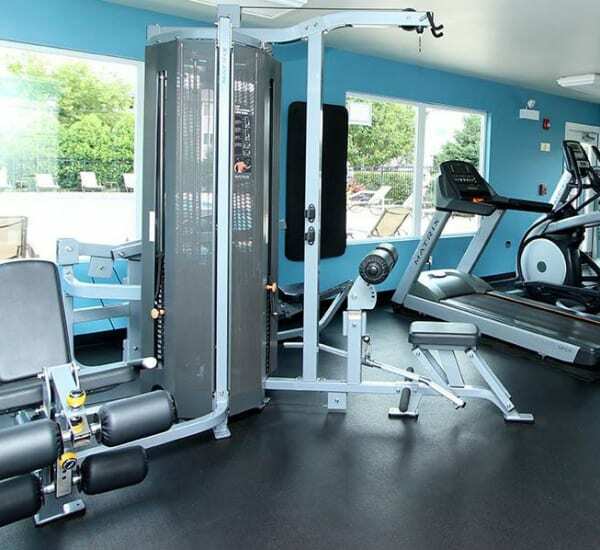 We have a modern fitness center for you to use, complete with cardio and weight equipment. Each of our apartment buildings also includes a clean, well-stocked laundry facility so you don’t have to worry about transporting your laundry to and from a laundromat. Enjoy the professionally landscaped grounds, featuring a fun playground perfect for kids of all ages. The resort-style sun deck is built for relaxation and entertaining, with a sparkling swimming pool, lounge area, and BBQ grills. The benefits of living at West Line Apartments don’t stop there. Our management and maintenance team is here to provide you with professional, timely service when you need it. For your convenience, our staff is bilingual to better assist you. We’re situated in one of the best neighborhoods west of Chicago. Hanover Park is half an hour from downtown and is easily accessible from West Line Apartments from the Metra station right across the street. The photo gallery gives you a preview of some of the amenities available to you at West Line Apartments. Take a look and then call us to schedule a tour to see the apartments and community in person.